Internal rate of return is very advance method of capital budgeting and it is based on time value of money. 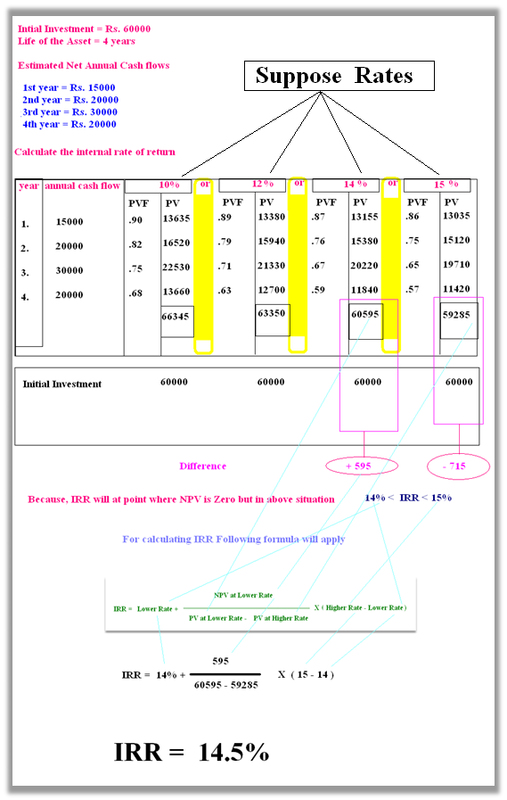 Like NPV and P.I., we also calculate the present value of cash inflows and cash outflows in this method. But this method is purely different from NPV and PI. Before understanding this method of evaluation of investment projects , you should know what is internal rate of return. If you have read the books of financial management of MBA or B.Com. class, you can give the definition of internal rate of return. Like other writers, I can also write that internal rate of return is the rate at which the present value of all cash inflows is equal to the present value of all cash outflows. After finding internal rate of return, we will accept that investment project whose internal rate will high or if there is only one project, then we will compare it with the minimum rate of return. If internal rate of return is more than cut off or minimum rate, then we will accept that single project. If any asset will give equal return, then you can easily calculate present value factor by dividing initial cash outflow with the annual cash inflow. Then we will see present value annuity table and with this we can find the value of IRR. We will compare this rate with cut off or minimum standard rate of return and if this rate is more than minimum rate then this proposal will be accepted. Second situation is fully on the basis of hit and trial. This situation is like experiment in laboratory. Very few people know, I had worked in chemical science laboratory, where my boss scientist always made some mixture for invention and he ordered me to mix chemical and 90% his experiment failed but he did not loose his confidence. Like this, finance manager has to assume the rate. Suppose it may be 5%, 6% or more and then he has to find factor value of this rate and multiply it with the actual value of cash inflows and cash outflows. If both are equal at specific rate that that rate will be internal rate of return. In this formula we can also take the difference of PV at lower rate and Pv at higher rate. Both will give same answer.